We've taken action on our guests' latest reviews! We apologize for not having the proper service and amenities before, now we've recently renovated the kitchen and increased and trained our staff so that we can please all your needs and offer you the best stay! Just a 5 minutes walk away from the main plaza we offer the best space to relax and enjoy an amazing view from the pool. 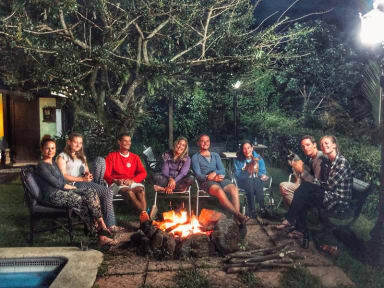 After a great hike at the waterfalls and exploring the little town of Juayúa, finish your perfect day enjoying some s'more at our daily fire with a nice cup of wine! Hotel Juayúa is located in the city of Juayúa, which belongs to 'La Ruta de las Flores' of El Salvador, an attractive old city with many touristic destinations, with pleasant climate, places of natural beauty, waterfalls, food festival and variety of entertainment. Its name in Nahuatl language means 'Place of purple orchids'.The nearest airport is El Salvador Airport, 87 km from the property. We have a variety of rooms to offer, starting from dorms, single and double rooms and a master suite. We do our best to provide a comfortable, clean and affordable place to stay with and rustic touch and an amazing view to the volcanoes and coffee plantations. Units have views of the pool or garden and they all have TV and A/C. Check in from 12:00 noon. Payment upon arrival by credit cash. Breakfast not included - Is only included in privates rooms NOT dorm rooms. This hostel is amazing! The dorms are so far the best ones I've stayed around Central America. Beds are really comfy and incredible clean, so as the bathrooms. They have beautiful private rooms as well. You wake up with an amazing view of all the volcanoes and they have a large green area and a pool that is perfect to relax after a walk around the town. The Central Park is 5min away walking and all the area is really safe. They can arrange you a tour to the waterfalls as well! Stay here!